The conference on “National and Civic Identities” was hosted in Ismayilli region, Lahich settlement by Center for National and International Studies on June 25, 2011. Leyla Aliyeva, President of the CNIS has opened the conference with a foreword “Above all Lagich is dear to us also because the founder of the Azerbaijan Democratic Republic M. E. Rasulzadeh has found a shelter here when fleeing from Bolsheviks’ persecution”. The Turkish guest speaker from the Ankara Univerisity, Dr. Tashansu Turker has opened a speech with “multiculturalism” policy in Turkey. “While people who moved from Africa and other continents to France have gained full citizenship rights only 30-40 years before, in Turkey multiculturalism was inherent already since the days of Republic’s establishment”. Based on Turkish scientist opinion, “The national, meaning ethnic identity should be the same with citizenship identity. However, at the same time the citizenship identity should not be preponderating over the national identity, each country should be demonstrating tolerance in this matter”. Mentioning inclinations to separatist movements within national minorities, Dr. Turker stated that, “being “patriotic” is not sufficient when establishing a state, to establish a state each nation should have statehood and governance traditions”. 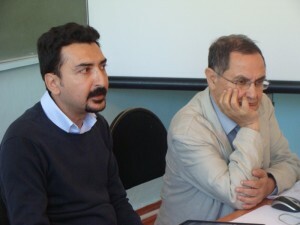 The professor of National Academy of Sciences, Dr. Rakhman Badalov has stated, “that already in mid 19th century the foundations of national and citizenship identity were established in Azerbaijan from the side of Azerbaijani scientists, in particular by Hasan bey Zardabi”. Sarkar Mardanov, who talked about numerous nations populating the area, has said that “21 nations’ representatives are dwelling in Ismayilli today. The link that unites all these nations between themselves is Azerbaijani language. For this we must be grateful to 76 intellectuals who established Azerbaijan Statehood back in 1918”.